Missing 1982 - 122 min. 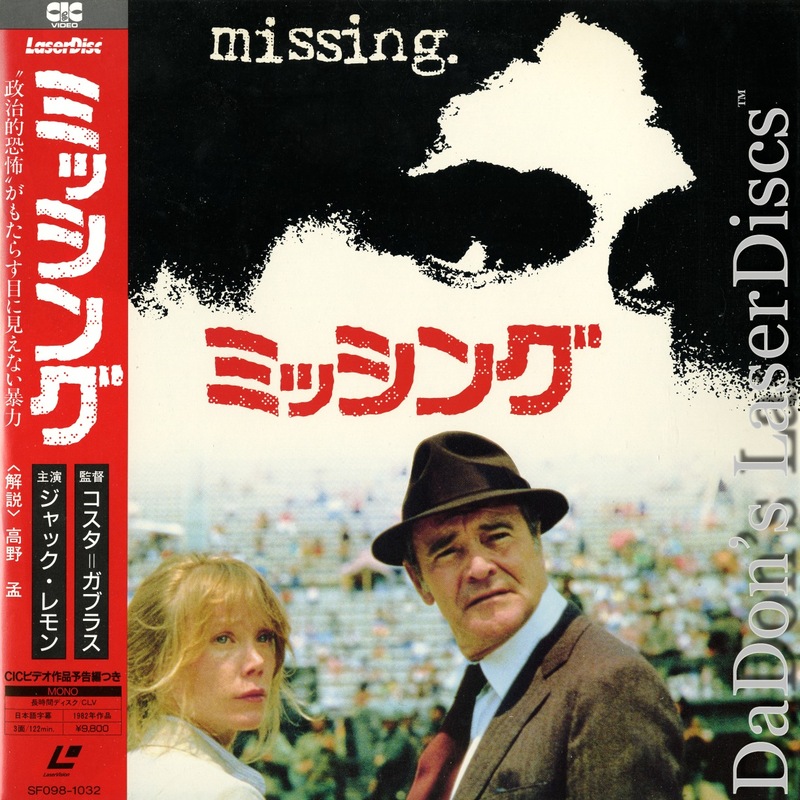 - Color Genre: Drama Rated PG Country: Japan LaserDisc Movie Storyline: Director Constantin Costa-Gavras made his English-language film debut with this political thriller, based on a true story. Although the nation depicted is never named directly, the action clearly takes place in Chile after the military coup. "Missing" centers around the disappearance of Charles Horman, an American expatriate who lives with his wife Beth in South America. One night, armed soldiers enter their home and drag him away. In desperation, Beth decides to contact Charles's father, Ed, and ask for help. In contrast to his left-wing daughter-in-law, Ed is staunchly patriotic. But as he gets the runaround from both American and Chilean officials, Ed receives a cold, hard lesson in political reality... and learns some ugly truths about US involvement in Latin America. LaserDisc Movie Review: Costa-Gavras's tense political drama opens in an unspecified South American country (though clearly intended to be Chile) in the throes of a military coup. American activist Charles Horman (John Shea), who has been a thorn in the side of the country's military ever since his arrival, suddenly disappears. In trying to find out what has happened, his wife Beth (Sissy Spacek) is stonewalled, not only by the ruling junta but by the American consulate. 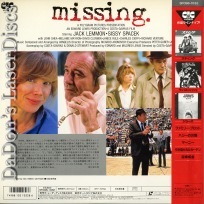 His father, staunchly patriotic Ed Horman (Jack Lemmon), joins Beth in her search. Ed and his daughter-in-law have never seen eye to eye politically, and he refuses to entertain the notion that his son's disappearance might be part of a larger conspiracy or cover-up. But as the days grow into weeks, Ed comes to the shattering conclusion that he and his family have been betrayed by the American government, on behalf of the "friendly" South American dictator who holds his people in a grip of iron. 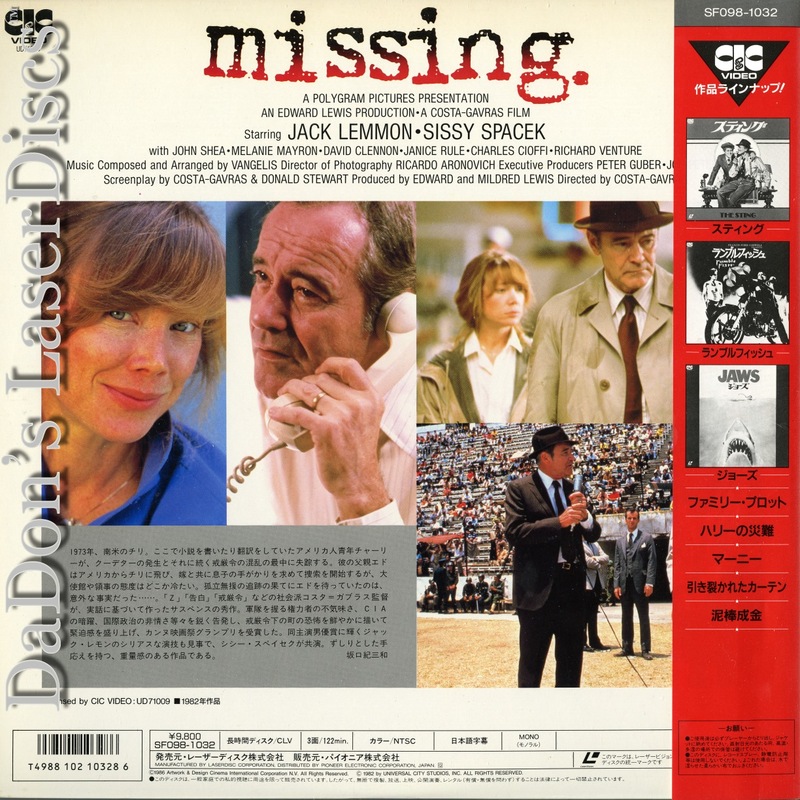 Adapted by Costa-Gavras and Donald E. Stewart from a book by Thomas Hauser, Missing was inspired by the true story of the late Charles Horman. In spite of (or perhaps because of) condemnation from certain high-ranking officials in the Reagan administration, the film went on to win an Academy Award for Best Adapted Screenplay, as well as nominations for Best Picture, Best Actor, and Best Actress. Thanks for Visiting DaDon's Rare LaserDiscs ! Reviews, Articles, Newsletter and Information for Movies on LaserDisc LD Laser Disc, LazerDisc.